If you’re considering a fishing a festival in 2018 here’s the full list. 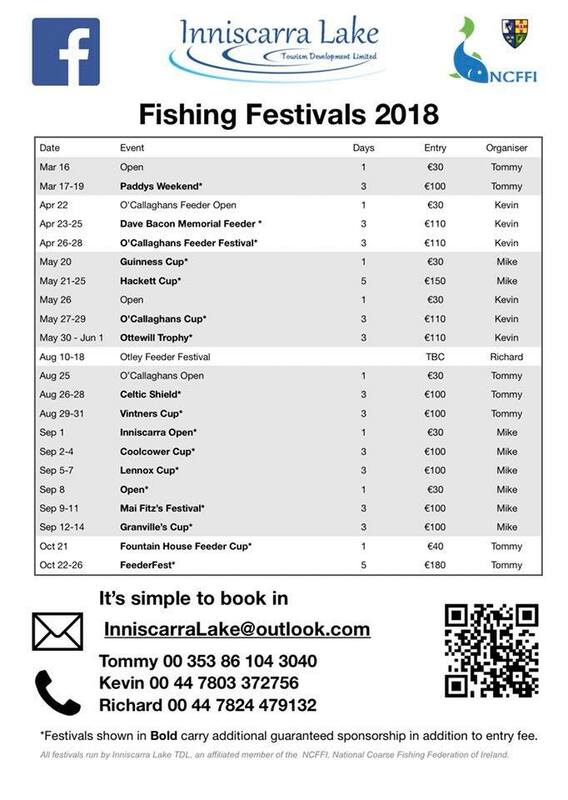 Visit www.ncffi.ie/inniscarra-angling to download your personal copy of the festival list; to view a full list of accommodation in the area, and for all other information related to angling on Inniscarra. Ps. If you want to stay in Coachford book in early! All the entry fees on our festivals are paid out in full with daily, overall and section money and the prices are set as such to make it worthwhile for those that travel long distances to attend. Many of the festivals also carry additional sponsorship! We are pleased to present the first angling festival of the year on Inniscarra lake! The St. Patrick’s festival combines three days of coarse fishing with the fabulous hospitality of the village of Coachford Co. Cork. Entry is €100 with full pay-out supplemented by great sponsorship from Jackie Lennox Chip Shop of Cork. An open match on Friday 16th provides 4 days of consecutive fishing for the visiting anglers Entry €30. The draw takes place at 9am at O’Callaghans Bar & Guest House where you can purchase your permits and bait from Trevs Tackle Ireland. Anglers are kindly reminded that for bio-security reasons all nets must be washed in the provided dip-tanks in the rear car park. With 40 now booked on the Paddy’s Weekend festival we look ahead to April where we offer a weeks match fishing for the feeder enthusiast. Two 3-day Feeder Only festivals preceded by a 1-day open. Book in to them individually or fish all three and take advantage of the hospitality in Coachford Co. Cork. Entry to the 3-day festivals is €110 with full pay-out supplemented by €250 sponsorship on each from Jackie Lennox Chip Shop and O’Callaghans Bar & Guest House. The open match on Sunday 22nd provides 7 days of consecutive fishing for the visiting anglers. Entry to the open is €30. The draw takes place at 9am at O’Callaghans Bar & Guest House daily where you can also purchase your permits, plus there is bait & tackle on-site from Trevs Tackle Ireland. Anglers are kindly reminded that for bio-security reasons all nets must be washed in the provided dip-tanks in the rear car par prior to fishing.